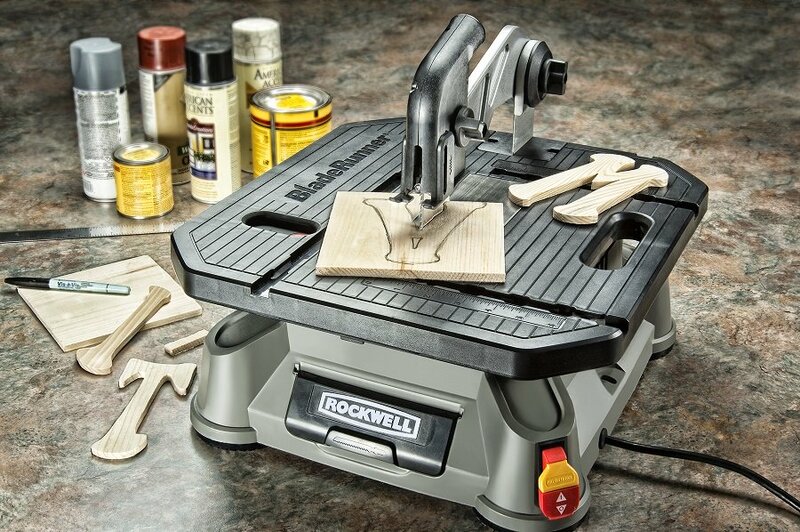 Rockwell’s wildly popular BladeRunner X2 is arguably the world’s most versatile benchtop power tool. It can cut virtually any building material (wood, plastic, metal, tile) and it can execute virtually any type of cut (crosscut, rip, miter, scroll, inside cutouts). The BladeRunner X2 accepts T-shank jigsaw blades and is powered by a 5.5-amp, 3,000-strokes-per-minute motor. It can crosscut a 2×4 and rip a board up to 6 in. wide. Yet it weighs just 15 lbs. Installing wood molding requires making smooth, accurate cuts in order to create tight-fitting joints. 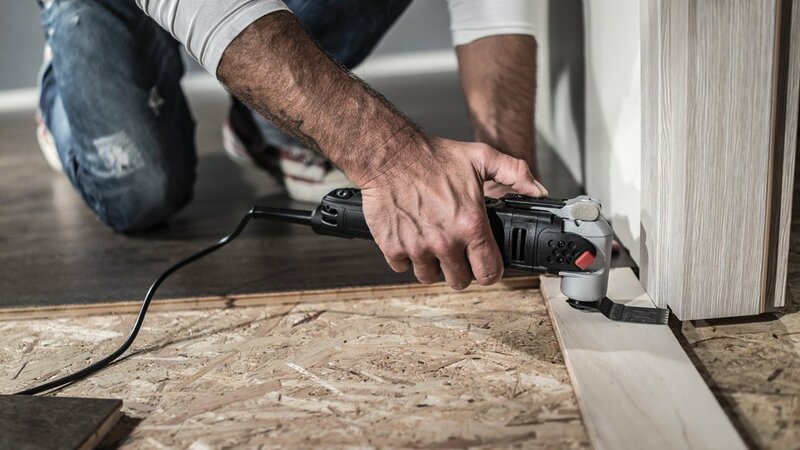 The BladeRunner X2 comes with an adjustable miter gauge that makes it easy to cut precise miter angles and perfectly square crosscuts in a wide variety of wood moldings, including baseboard, shoe, chair rail and window and door casings. It’s also an ideal tool for accurately cutting picture frames to the proper length and miter angle. The max-capacity miter gauge rotates up to 60 degrees to the left and right. When fitted with the proper metal-cutting blade, the BladeRunner X2 provides a quick, clean way to saw through copper pipes up to 1¼ inch in diameter. Use the miter gauge to ensure perfectly square cuts and use slow, steady pressure for the smoothest cuts. Then, use a strip of emery cloth to remove any burrs or rough spots from the end of the pipe. Note that this same technique can be used to cut EMT (electrical mechanical tubing), which is more commonly known as, electrical conduit. The ¾-inch-stroke reciprocating action of the T-shank jigsaw blade used by the BladeRunner X2 provides a quick and easy way to slice through PVC, ABS and other resilient plastic pipe, up to 1¼ inch in diameter. The miter gauge provides an accurate way to produce square crosscuts, but you can also get excellent results by simply cutting the pipe freehand. Grip the pipe on each side of the blade and hold it down tight to the table during the cutting process. The one feature of the BladeRunner X2 that always surprises first-time users is that this compact tool is amazingly effective at cutting ceramic tile. And unlike a wet saw, it cuts tile cleanly without spraying water everywhere. To cut tile, install a diamond-grit or carbide-grit jigsaw blade. These types of abrasive blades have no teeth, and cut on both the up and down strokes, which produce extremely smooth cuts. Besides ceramic tile, the BladeRunner X2 can also be used to cut other extremely hard, abrasive materials, including thin stone, cement backerboard and fiberglass. When fitted with a narrow scrolling blade, the BladeRunner X2 can compete with most portable jigsaws and stationary scrolls saws for making extremely precise and intricate scroll cuts in wood, plywood, hardboard and thick veneers. The narrow blade can be deftly maneuvered around inside and outside cuts, and for sawing circles, ovals, sharp angles, corners, deep notches, extremely tight radiuses, and virtually any odd shape. The tool’s scrolling capability is particular useful for making toys, models, and cutting out wooden letters for signs and nameplates. The BladeRunner X2 comes with an adjustable quick-lock rip fence that allows you to safely and accurately rip plywood, hardboard, particleboard, MDF, and other sheet goods to width. Now, it can’t compete with the power and speed of a full-size stationary table saw, but the BladeRunner X2 is more than capable of making rip cuts, especially in material that’s ¾ inch thick and thinner. The BladeRunner X2 is an excellent tool for DIY flooring installations. It can be used to rip, crosscut, even miter-cut most types of flooring, including hardwood, engineered wood, laminate, bamboo and cork. Employ the saw’s miter gauge or rip fence whenever possible, and always cut the floorboards with the finished surface facing up. That way, any splintering will occur on the bottom side. Using the BladeRunner X2 as a stationary jigsaw provides the absolute safest, easiest, most accurate way to cut aluminum up to 3/8 inch thick. This includes aluminum flat bar stock, round pipe and rods, and hardware, such as shelf brackets, door tracks, and fence parts. Mount the included aluminum-cutting blade into the saw and use slow, steady pressure to produce the smoothest cuts.